My name is Robert and I've joined this forum to obtain some more knowledge in Airsoft. Currently I know very little as I have only recently discovered the sport, and I am finding it a bit overwhelming to find places in Hertfordshire/Middlesex that accept newbies and rent their equipment. Plus reading through posts I can see a lot of UKARA which I'm not quite sure I understand if I need to register yet and what not. So many guns, so many abbreviation's. But I will learn it all and I look forward to being out on a field soon. I couldn't tell you anything about sites down south as I live in the lovely north! Regarding UKARA essentially you can buy any 2 tone rifle (something that is at least 51% a non realistic colour such as orange) without UKARA. If you have been playing airsoft at the same field for 2 months or longer and have been there at least 3 times in that period of 2 months then you can apply for your UKARA membership. You will need to fill in a form (I done mine online) and then the site will verify that you have been at least 3 times then you will get confirmation of your UKARA number then you are good to buy RIF (realistic imitation firearms). Make sure your address is right as this is how they check if you are registered! From experience I would say DO NOT rush into buying a rifle and wait until you have your UKARA as it saves you spraying a gun. Id recommend you just use hire guns and see how they feel and when you are at sites don't be afraid to ask questions on what people use and if they can show you their gun/gear, 99.9% of people will show you and let you have a shot, and use hire guns to see what you like. Most of all enjoy yourself and call your hits! I do drive, willing to travel pretty much anywhere to have a great day out. I will take a look at their site (should they have one) thanks a lot! *Edit* I've seen that site already, and it's only a 40 minute drive for me, so could be a perfect place. Have you been there yourself? Thanks for the information. I plan to hire for the next few months - into 2017 as Im saving for a wedding and I dont think the Mrs' will be too happy with the money spent! Although I could buy her some shoes to keep her quiet for a day or so. I am seeing that the general community of Airsoft generally want to help new players anyway so that is a good shout to ask people at the sites. Real firearms (shot guns and rifles) are registered to my address (through my step father) will that cause any issues? No problem, yeah that's a good reason to not buy yet! I've noticed that's a case for most people that if you buy yourself a new toy pew pew you need to buy the Mrs' something too! Yeah the airsoft community is great as the community needs to keep existing players in and also get new players interested, makes the hobby better for everyone! That should not be an issue as I believe they are covered by different laws (someone else may correct me on that), from the people I know who play airsoft and also have real rifles I have never heard of them having that issue before. Perfect, thanks for info again. I don't assume it will cause and issue but better to be safe than sorry. If you have any questions feel free to drop me a message! There is a lot of knowledge on the forum, just a case of reading older threads and using the search tool (although searches need to be 4 caracter minimum). Thank you for the post. I have already read most of these, just about trying to get my head around everything. If I understand right you just mean customization such as putting optics and attachments onto your gun? If so you can do it with both as you don't need a UKARA for buying attachments. No I meant paint etc. If you buy a black gun I assume you can paint it camo or something else whereas a two tone you're not supposed to paint it? I see, In theory you can paint a two tone whichever colour you want as a UKARA only stops the sale of RIF, if you want to put a custom paint job over your 2 tone then I would say go ahead really, just make sure you tape everything you don't want to spray! Haha its a fair point though, its something that would be hard for them to control, just dont go shooing your 2 tone or RIF in a public area as the 'boys in blue' may get called anyway which may end up being a bad day out! UKARA is only a retailer database of players' site membership. Wouldnt be shooting in a public place. If anything it would be inside, or in the garden. Or down in the estate I actually shoot in. Then I stand (sit) correced, the law would say you cant put a custom paint job onto a IF (2 tone), Even I have learned something today, however as I said before it would be a hard one to police but not worth risking! No if you paint a two tone without a valid defence such as site membership or being on the UKARA database then you are committing a crime. Its illegal to manufacture a rif without a defence. Painting it classes as manufacture and this is the second time in a week someone has given the same bad advice. People really should learn the rules before advising others on them. 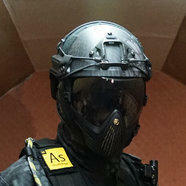 UKARA is the United Kingdom Airsoft Retailers Association. Its a database of site memberships to enable sellers to check defence in easy way. To qualify for site membership which is the main form of defence you need to play 3 games in a period of no less than 2 months and no more than a year at the site. Once you have your membership you can be entered on the UKARA database. Yes but not recently. Its about 40 acres of woodland and if nothing else, its local. Its always busy and they get a lot of rentals - usually about twenty a game. I got my original UKARA there but now prefer to do milsims or drive up to Gunman Tuddenham because I like less players. AWA Herts = Been there once, didn't like it compared to other sites, crappy road leading to the safe zone my BMW did not like! And what i would call a veyr poorly set up safe zone IMO but each to their own. Red1 The School = Has a decent but small CQB based around an old school, can get a bit over subscribed as its quite popular so a lot of queuing but ahh for the love of tarmac and not MUD. they also have a small woodland area as well that they use which is not bad, entire safe zone is indoors and on concerete. Dragons Lair Airsoft, Kelvedeon Hatch, Ongar = A Small family run site, decent road leading to safe zone, small-ish site but pretty open giving it the feel like its bigger than it actually is, good shop (run by the guys from Airsoft Zone in Romford) and very good food! I'm gonna be honest and state that this is amongst my favourite of sites as its where my airsoft playing began and they've been a good bunch. Thanks for letting me know. Some great information there.